Georgia high school star, Darius Slayton could likely be choosing between Georgia and Auburn in the next couple months says Michael Carvell of the AJC (story here). I’ve thought for a while now that Darius is all Dawg, and I stand by that. Slayton loved his visit to Athens for the Clemson game, and he’ll be in Columbia on Saturday to watch the Dawgs beat the Gamecocks. He’s expressed interest in committing soon, and if things go well against South Carolina, I could see Georgia picking up their 22nd commitment in the next couple of months. Jake Rowe of 247 Sports caught up with Darius and found out some interesting things about his recruitment. Story here. Check out Slayton’s highlights from the other night (**Awesome 1-handed catch in there). In case you missed it the other day, here are the first game highlights of star 2016 QB commit, Jacob Eason. Michael Carvell caught up with Eason’s dad this week and found out some really interesting things about the junior phenom. Eason is still 110% committed to the Dawgs, and has been going hard after other 2015 and 2016 recruits. From Jacob’s twitter and his dad’s comments, you really get the sense that he is beyond excited to get to Athens in a couple years. Like many of you, I’m anticipating his arrival in 2016, and I could easily see him becoming our starting quarterback as a freshman. The interview with Eason’s dad can be found here. Highlights of 4-star offensive lineman commit, Patrick Allen, and story here. 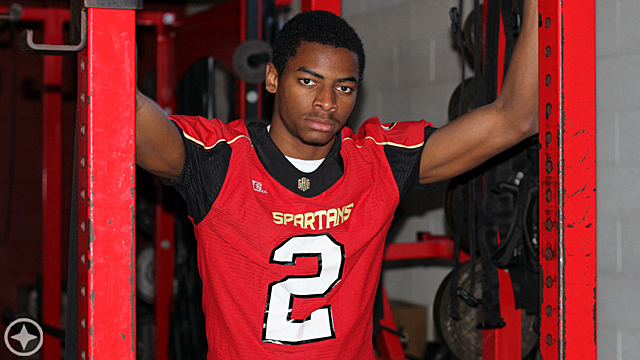 UGA vs. USC Recruiting Battles: Mike Davis, The One That Got Away? Chris Clark of Rivals.com put together a great article reviewing some current UGA and USC players that were offered by both the Dawgs and Gamecocks. Honestly, there weren’t a ton of players that UGA really wanted that ended up choosing the Gamecocks, but there were a few. Bryson-Allen Williams was certainly someone that the Bulldogs wanted, and many people thought we had a good chance with him going right up until signing day. Shaq Roland, star South Carolina receiver, is another player who the Dawgs would’ve loved to have gotten. Mike Davis was another player that UGA offered, but I am in no way serious when I question whether he was “the one that got away.” Davis was a part of the same recruiting class as Todd Gurley and Keith Marshall, and actually committed to the Gamecocks on the same day that Gurley committed to the Dawgs. I think we won there. Check out the rest of the players here. Posted on September 11, 2014, in Auburn, Blog, General Sports, Georgia Bulldogs, Recruiting, SEC, South Carolina Gamecocks. Bookmark the permalink. 1 Comment.